OKLAHOMA CITY – Legislation unveiled today would empower parents who are in crisis to find a home for their children without the involvement of the Department of Human Services, according to the bill’s author. 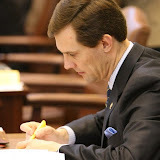 House Bill 2536, by state Rep. Jason Nelson, would create a legal power of attorney for parents to use when placing their children with a host family. The legislation also modifies existing child placing licensure laws to ensure that the laws don’t frustrate or prohibit the work of private groups and host families who are caring for the child of a parent in crisis. Even as reforms and additional resources are put in place at DHS the number of children coming into state custody continues at an alarming and unsustainable pace, Nelson said. In 2009, a research report that examined Oklahoma’s foster care system recommended that the state seek partnerships with the faith community in meeting the need for foster homes. The Count Me In 4 Kids collaborative is ready to take this a step further by working with the faith community to help families in crisis get back on their feet and avoid the circumstances that lead to DHS involvement. “Many of us from the Count Me In 4 Kids collaborative are excited to be here today as our state moves forward in helping many more compassionate and caring Oklahomans step up to love and nurture some of our most vulnerable children,” Lynn Institute President Karen Waddell said. “We are committed to bringing the Safe Families model to Oklahoma out of our shared belief that every child deserves to have a safe place to call home and celebrate this next important step. Nelson said he is confident in the ability of Count Me In 4 Kids to help with child welfare challenges in Oklahoma. DHS Director Ed Lake said he supports the legislation. For more information on Count Me In 4 Kids and ultimately Safe Families, visit www.CountMeIn4Kids.org.